Cho Chikun Wins 73rd Title: The final of the fourth Igo Masters Cup was held at the Nihon Ki-in in Ichigaya, Tokyo, on July 12. Taking black, 25th Honinbo Cho Chikun (right) defeated Kobayashi Satoru 9P by 6.5 points to win this title for the second time. This is Cho’s 73rd title, so he extends his Japanese record. Incidentally, this was the 59th game between these two; Cho now has a lead of one over Kobayashi. Meijin League: Kono Rin (left) won his seventh-round game, so he stays in a tie for second with Cho U 9P. Kono and Cho play each other in the final round, so, if Yamashita loses, the winner will meet him in a play-off to decide the challenger. (July 11) Kono Rin 9P (B) beat Ryu Shikun 9P by resig. ; Murakawa Daisuke 7P beat Yuki Satoshi 9P by resignation. Kono’s Winning Streak Ends At 19: A loss, to Murakawa Daisuke 7P, in the quarterfinals of the 62nd Oza tournament on July 17 was Kono Rin’s first since mid-April. His record of 19 successive wins is the best winning streak so far this year. Iyama Catches Up In Gosei Title Match: In the second game of the 39th Gosei title match, played in the Hokkoku Newspaper Hall in Kanazawa City, Ishikawa Prefecture, on 20 July, Iyama Yuta (B) defeated Kono Rin 9P by resignation after 151 moves. This gave him revenge for his loss of the first game in 129 moves. Kono perhaps lost the game because of pessimistic positional judgement: he believed that the result of the first big fight was unfavorable for him — the players following the game disagreed — so he made a deeper invasion than he would have otherwise. Iyama attacked aggressively and killed a large group. The third game will be played on August 11. By the way, I need to correct a mistake I made in my report on the first game. I wrote that Kono suffered straight losses last year, but I was confusing this title match with the 2012 Tengen title match, which Kono did lose 0-3. In the 2013 Gosei, he won the first two games, then lost the next three. Kisei Leagues: The first third-round game in the A League was played on July 11. Hane Naoki 9P beat Ichiriki Ryo 7P by resig. This was Hane’s first win after two losses. Ichiriki drops to 0-3; he is having a tough initiation in league play. On July 17, Yamashiro Hiroshi 9P beat Takao Shinji Judan by resignation. More games played on July 24 clarified the lead. In the A League, Yamashita Keigo 9P beat Kono Rin 9P by resignation. Kono (2-1) suffered his first loss, so Yamashita (3-0) is the sole undefeated player. In the B League, Murakawa Daisuke 7P (B) beat Yuki Satoshi by resignation. Yoda Norimoto 9P (B) (2-1) beat Kobayashi Satoru 9P (2-1) by 1.5 points, so Murakawa (3-0) is the sole undefeated player. It looks as if we might see a replay of last year’s play-off between Yamashita and Murakawa. The latter’s continued success shows that he is close to joining the top group of tournament players in Japan. An education program for middle level players…an educational library on the web site for members only… a rewards program. These are some of the ideas Central Region Director Bob Gilman is looking for feedback on in preparation for a special session at the upcoming US Go Congress to discuss ideas for overall development of the organization. Read more about these ideas and comment here. David Cho 2D topped a field of 30 players at the Massachusetts Go Association’s annual Skip Ascheim Memorial Go Tournament on July 13th. The winners were David Cho 2D (at right in photo at left), who took first place with a 4-0 record; Pete Schumer 2k (at left in photo at left) was second, also scoring 4-0; Brandan Williams 20k (at left in photo at right), and Alex Linden 11k, both 4-0, tied for third. “Wang Ma 7D said he would be glad to play games online with fellow members of the Massachusetts Go Association,” says Tournament Director Eva Casey. Reach him at doctormawang@126.com. photos by Eva Casey; click here for tourney photos. Students at McCormick Elementary, in Chicago, IL, had the opportunity recently to learn to play go from Xinming Simon Guo 5D, a licensed math teacher and founder of the GoAndMath Academy. “Students were playing a simple game during the class, blissfully unaware that they were also working on math skills as they put every stone on the board and counted the result at the end of the game,” Guo told the E-Journal. At McCormick, 99.5% of the students are hispanic, 50% of whom are English Language Learners. The go class is part of the Chinese Artists-In-Residency Program, co-sponsored by Confucius Institute in Chicago (CIC) and GoAndMath Academy. The Chinese language teachers at McCormick, Ms. Yeh and Ms. Huang, heard about the go program during the professional workshop organized by CIC last year. “Go is an ideal tool to achieve the goal of our Chinese curriculum–to enhance students’ understanding of Chinese culture, and reinforce their learning of language skills,” says Guo. “During the entire 2013-2014 school year, the go program offered more than 130 learning sections to more than 4500 students in Chicago public schools,” said Jane Lu, the director of CIC and coordinator of CPS Chinese World Language Program. 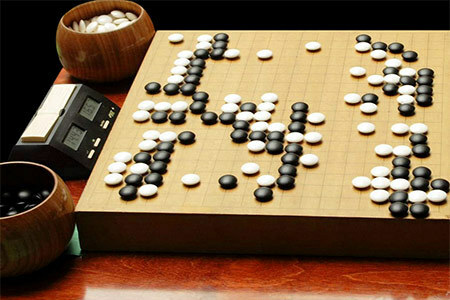 “Go is not just a simple game,” says Guo. “Research by GoAndMath Academy reveals that there exists a hidden natural connection between math and go. Students can experience math concepts without even noticing them. More specifically, go helps students develop number sense, and three domains in Common Core standards: Counting and Cardinality; Operations and Algebraic Thinking; and Number and Operations in Base Ten. GoAndMath Academy designed the educational go program, which is appropriate for Pre-K through eighth grade, is aligned with the common core standards, and can be played with peers in school or around the world. This fantastic game combines math, science, art, and competition, as well as ancient oriental philosophy and culture. Go requires the highest level of critical thinking. It cultivates the abilities of observing, reflecting, imagining, reasoning, innovating, and decision-making,” says Guo. – Paul Barchilon, E-J Youth Editor. Photo: Guo demonstrates the secrets of holding the go stone. Go World: Complete Print Collection for Sale: All 129 issues, most in mint condition. Best offer over $1000 plus shipping, or pick them up at the Congress. Write to roylaird@gmail.com. Go Review Print Collection for Sale: More than 100 issues of Go World‘s predecessor, an English-language monthly published by the Nihon Kiin. The first attempt ever to explain the finer points of the game in English. Starting with issue #1, this collection contains all issues through 1972 (except for 1964 and two 1968 issues). Quarterlies from 1975 to 1977 also included. Good condition. Best offer over $500 plus shipping, or pick them up at the Congress. Write to roylaird@gmail.com. Sharpen your endgame skills and see what is possible when all liberties have been filled! After the first two rounds of the European Go Congress, there are only three Europeans with perfect scores: Ilya Shikshin from Russia, Fan Hui from France and Cristian Pop from Romania. Also undefeated are Yulin Tong, Chi-min Oh, Chen Wang, Young-Sam Kim and Zexiang Sui (click here for latest results). The MLily-WeiqiTV European Go Congress – the 58th edition of the EGC – is being held July 26th through August 9th in Sibiu, Romania. Alexander Dinerstein (left), several-time European champion faced Fan Hui (right), last year’s winner, in the second round. “Fan Hui won by 3.5 points but according to several players there, Dinerstein must have made a mistake because the feeling was that the Russian was ahead.” Click here for the latest EGC blog reports. Sasaki Tadashi 8P of the Nihon Ki-in passed away on July 20 at just 51. Sasaski, who visited the United States many times doing teaching games and workshops, had attended most of the U.S. Go Congresses over the last few years and had planned to attend this year’s in New York City. His death was a shock his many American friends and fans. “It’s terrible news,” said AGA President Andy Okun. “His teaching was always sharp, but full of humor as well, and his company warm and enjoyable.” “Mr. Sasaki was a big supporter of the Seattle Go Center and an enthusiastic hiker,” added Brian Allen of the Seattle Go Center. “We always enjoyed his visits to the Northwest.” Plans for a memorial ceremony at the Congress will be announced soon. – photo of Sasaki playing Andrew Jackson at the 2011 US Go Congress, posted on Sasaki’s Facebook page. Lee Sedol 9p (left) advanced his lead in the MLily Gu vs Lee Jubango after defeating opponent Gu Li 9p in their most recent match on July 27 in Liuan. After six games, Lee is ahead of Gu at 4-2. During Game 6, the opening favored Gu (B) but Lee seemed to ensure his victory over the course of the game through insightful cuts, sacrifices, and trades. However, the game became more complicated with moves 146 and 148, leaving fans with white knuckles for the last 30 moves. Each move could have swayed the game but Lee persevered until Gu resigned at 178. Although Gu and Lee have established a pattern for their wins and losses (Lee won games 1 and 2 while Gu took games 3 and 4, etc. ), game 7 will be a key match in the 10 game series. If Lee succeeds, he will force Gu against the ropes. If Gu comes back, Lee will need to be nearly flawless in games 8 through 10. Game 7 will take place in Lhasa on August 31. In the meantime, fans can read preliminary analysis on game 6 by An Younggil 8p on Go Game Guru. For more information about the MLily Gu vs Lee Jubango including photos and coverage of previous games, please visit Go Game Guru. Lee Sedol 9p extended his lead against Gu Li 9p to 4:2, when he won game 6 of their 10 game match on July 27, 2014. From left: Lee Sedol 9 dan, Ni Zhanggen (sponsor) and Gu Li 9 dan. The sixth game of the MLily Gu vs Lee Jubango was held in Liuan, Anhui Province, China. Once again, Gu Li’s skill in the opening gained him an early lead and the game favored Black after 27 moves. …When Black played a double hane at the bottom, and then extended with 45, Lee Sedol didn’t miss a beat. He cut White’s group in two and started a fight in the bottom right corner. Black fought back resolutely, but White promptly sacrificed two stones – gaining sente moves in the center and turning to attack Black on the left side. In the fighting that followed Lee was able to catch up again. Lee Sedol at game 6 of the MLily Gu vs Lee Jubango. White’s empty triangle at 112 was hard to see, but it was a brilliant move which made miai of L9 and G4 for White. This instigated a large trade. When the dust settled at 122, White had captured Black’s right side group and made two of his own groups strong in the process. It looked like White was well on the road to victory when he played 134. However, just when we were were thinking it was over already, the game became unexpectedly complicated, with White 146 and 148. Spectators were left on the edge of their seats for another 30 moves – where any move could decide the game. It was no longer a sure thing, but Lee Sedol pulled through and grasped his fourth win for the match. Black resigned after 178 moves. Gu Li is under pressure after another disappointing game. The players have alternated between two games each in the match so far. Lee Sedol won games 1 and 2, but Gu Li came back in games 3 and 4, and so on. It’s as if they were exchanging rhyming couplets! Gu Li better hope this pattern continues, because if he loses game 7 he’ll have to face three successive kadobans (match deciding games) and will be up against the wall. Game 7 will take the players back up to the heavens, this time in Lhasa (August 31). Since altitude sickness was a factor in game 5, we might see the players doing some altitude training in the next month. Lee Sedol is in a good position as the match passes the halfway point. Gu Li started the game with a nice opening up to Black 27. White 20 and 24 looked questionable in this sequence. White 36 was an unexpected ladder breaker, but the result up to Black 41 was still good for Black. Black 43 and 45 were too much, and White countered with White 46 and 48. White caught up by sacrificing two cutting stones at the bottom. White 62 and 64 demonstrated Lee’s unique attacking style. They were practical moves, well suited to the situation. The continuation up to White 72 was successful for White and the game became even again. Black 85 and 87 were sharp, but White’s responses were accurate up to White 96. The game was still playable for both players. White 98 and 100 were nice haengma, but White 104 and 106 were overplays. Black 109 was careless, and the game suddenly became difficult for Black. White 112 was a brilliant move, and Black was in trouble. The trade up to White 122 was very good for White, and White took a solid lead. I couldn’t find any other options for Black after Black 109. Black 123 to 129 were a nice way to resist, but White didn’t give Black any chances to catch up with 134 and 138. White 146 and 148 were big mistakes and they made the game very complicated. White didn’t need to play aggressively like this, because he was already well ahead if he just played it safe. Black 153 was an incredible move and the game descended into total chaos. However, Black 157 wasted a good opportunity. Black should have played at 162. White 162 seemed to be a mistake, and Black 167 was the last losing move. He should have played at 169 first, and it still would have been difficult for White to wrap up the game. White 168 and 172 were the finishing blows and Black resigned. Lee Sedol (left) and Gu Li – Game 6, MLily Gu vs Lee Jubango. Wang Runan 8 dan (center) oversees the match. Two of the world’s top Go players, Lee Sedol and Gu Li, will play a jubango throughout 2014, to decide which of them is the stronger player. A jubango is a 10 game match between two players. The term originates from the Japanese language and has been imported into English language Go parlance. The first player to win six games wins the match. The official name for this event is the MLily Gu vs Lee Jubango. MLily is a mattress and bedding company that also sponsors the MLily Cup. Lee Sedol vs Gu Li Jubango – Game 5 is this weekend!